Wines & Vines counts 8,990 bonded and virtual wineries; 8,287 in U.S.
San Rafael, Calif.—The number of wineries in North America grew at a faster pace in 2014, as 599 net new wineries were in business, or 7.1% more than in 2013, when winery growth was just 4.3%. Wines & Vines magazine reports this sign of a booming wine economy in its 2015 Directory & Buyers Guide, along with thousands of other data points and 12 other extensive content sections. The total number of wineries in North America rose to 8,990. The U.S. accounted for 525 new wine producers. California was home to 3,913 wineries, or 47% of the U.S. total. The data also showed that U.S. wineries grew in case production by 5.6%. Wines Vines Analytics, the magazine’s market-research team, released these numbers on the first day of the Unified Wine & Grape Symposium in Sacramento, Calif. The number of virtual wineries grew by 23% in 2014, while bonded wineries grew by 4%. Bonded wineries have their own brick-and-mortar production sites, while virtual wineries have brand names and produce wine at host facilities. 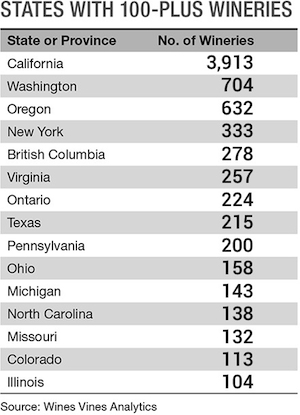 Fifteen states and provinces were each home to more than 100 wineries in 2014. Oregon gained 66 net new wineries, giving it the biggest increase after California. The only change in the order of the states and provinces from a year ago was that Ontario, with a gain of 32 wineries, passed Texas in winery counts. British Columbia added 21 wineries. 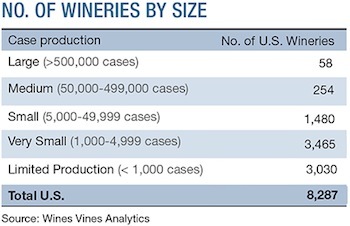 The category of small wineries (1,000-4,999 cases) gained the most new wineries in 2014, followed by limited-production wineries (less than 1,000 cases). Not much change happened among the bigger producers, as the medium winery category added just one net winery and the large winery category added two. The 2015 Directory & Buyer’s Guide presents a wealth of information about the North American wine industry contained in two major sections: the Winery Directory, which has detailed information about every winery, and the Buyer’s Guide, which contains content about equipment, supplies and services for the wine industry—plus a wide array of other valuable information for wine producers, grapegrowers, wine industry trade members and suppliers to the wine industry. The current edition features more than 550 North American wine grape growers, more than 900 wine distributors listed by metropolitan area with contact information and the wineries and brands they represent, and a completely updated direct shipping compliance section, among many other content offerings. The Buyer’s Guide informs winery and vineyard managers where to find their equipment and supplies, including entries for 279 cooperage suppliers, 100 bottle suppliers, 197 tank dealers and thousands of other listings. The 2015 Directory & Buyer’s Guide comes in a spiral-bound 772-page print format and is also accessible in searchable format online. Both are included for one price. • Suppliers listed by those serving wineries, vineyards and general customers. Wines & Vines’ 2015 Directory & Buyer’s Guide is available for $95 through the magazine’s website, winesandvines.com. For more information, contact publisher Chet Klingensmith at chet@winesandvines.com or (415) 453-9700, or editor Jim Gordon at jim@winesandvines.com or (415) 453-9700. Wines & Vines is based at 65 Mitchell Blvd. Suite A, San Rafael, CA 94903.